"This Man, This Monster." 1st appearance of Negative Zone. 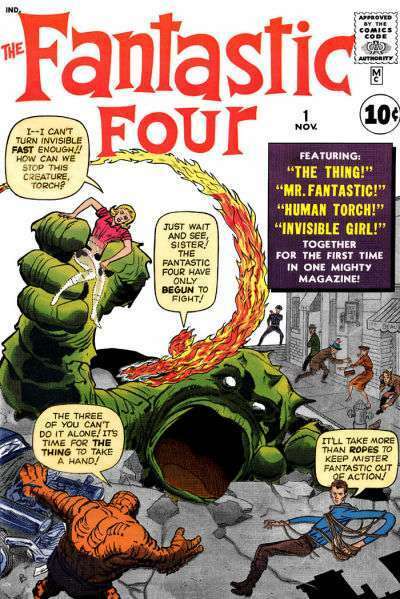 Fantastic Four #51, 2nd printing is out-of-stock. Fantastic Four #52 is out-of-stock. Fantastic Four #53 is out-of-stock. "Klaw, the Murderour Master of Sound." Origin of Claw. Versus Klaw. "Enter Doctor Doom." Appearance of Inhumans, Doctor Doom. "The Dismal Dregs of Defeat." Appearance of Doctor Doom, Lockjaw, Silver Surfer. "The Peril and the Power." Appearance of Inhumans, Black Panther, Doctor Doom, SIlver Surfer, Watcher. "And One Shall Save Him." 1st appearance of Blastaar. Appearance of Sandman. "Blastaar, The Living Bomb-Burst." Versus Blastaar & Sandman. "From Beyond This Planet Earth" 1st Appearance of Kree, Kree Supreme Intelligence, Ronan the Accuser. What Lurks Behind the Beehive? Origin of Him (Warlock) Part I. *Origin of the Enclave, Him (later Warlock). *1st Appearance of Him(later warlock), The Enclave (unnamed). *Appearance of Crystal. "His Mission: Destroy the Fantastic Four". Versus Mad Thinker. "By Ben Betrayed!" Versus Mad Thinker. "When Fall The Mighty". Versus Mad Thinker. "And So It Ends." Versus Mad Thinker. "The Flames of Battle." Appearance of Daredevil, Spider-Man, Thor. Versus Doctor Doom. "When Calls Galactus." Appearance of Galactus, Silver Surfer. Versus Galactus. "Worlds Within Worlds." Appearance of Galactus, Silver Surfer. Versus Galactus.